Shower valves are used to control water flow in your bathroom shower. Some valves will divert water between two outputs and others can limit water flow which is ideal for high pressure water systems. With so many shower valve choices available, it is hard to know which one you will need to solve your specific problem. You may wonder what is the best shower valve for your particular bathroom shower setup. We have reviewed 10 shower valves that can solve a wide range of shower fixture issues. After reading these reviews, you will have a better idea of what will work for your situation. This is the Delta MultiChoice universal tub and shower valve body rough-in kit. It allows easy changes to shower function, style and appearance without altering any of the plumbing behind the wall. 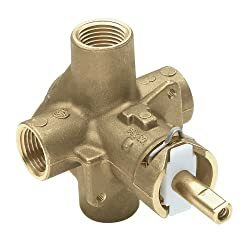 This Delta R11000 diverter valve is has a forged brass body. It replaces the Delta 6-setting, 3-porter diverter rough-in valve (part number R11600). It is intended to be used with a 3-function or 6-function diverter rough-in. You can test this diverter valve with air at 200 psi (pounds per square inch) or water at 300 psi using the supplied test cap. This assembled part is about 4-inches by 3.5-inches by 3.6-inches. The diverter trim is not included with this kit. Depending on the type of trim you select, you may need to buy additional components to finish your installation. If you want to change the look of your bathroom and upgrade the trim style or swap out fixtures, then the Moen 2510 shower valve may be the right choice. This shower valve lets you make upgrades to your fixtures without touching the plumbing behind the wall. This shower valve is part of the Moen M-Pact common valve system. 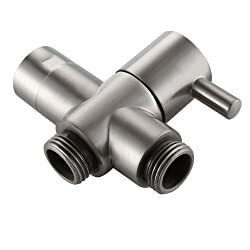 It is easy to install and will fit all ½-inch IPS (iron pipe size) connections. 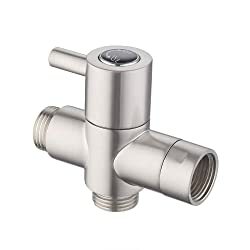 It has 4 connection ports and includes the Posi-Temp pressure-balancing control valve for maintaining water temperature control. This shower valve is compatible with all Moen M-Pact trim kits. It includes a temperature limit stop for added safety which needs to be set before you install the decorative trim. Additional components will allow back-to-back installations. This valve is backed by Moen’s limited lifetime warranty. This shower valve gives you a lot of flexibility and options for upgrades to your shower and tub trim and fixtures. This diverter valve allows you to divert water between a fixed spray shower head and a handheld shower head. It is a 3-way valve that has a single G ½ female inlet for water intake and two G ½ male outlets for water output. 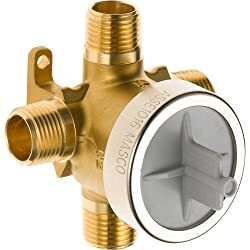 MINGOR has made this shower valve out of brass and they make it in a single piece so there is no chance of parts breaking off of the valve. The polished chrome finish allows this diverter valve to blend in with your existing chrome fixtures. It has a small lever on the outside edge for easily diverting water between the handheld shower head to the overhead shower head. MINGOR offers a 5-year product quality warranty on this product. 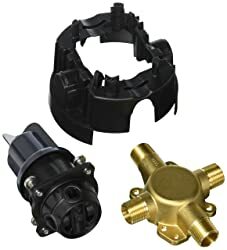 This Kohler universal kit includes a shower valve body, a pressure-balancing cartridge, a rough-in guide and a mud guard. This comprehensive kit will let you make upgrades to your shower fixtures and trim without tearing into the plumbing in the wall! The Kohler RITE-Temp shower valve system fits all standard ½-inch inlets and outlets. It has a single lever design which allows you to cycle from off all the way through cold to hot. Kohler uses pressure-balancing technology for anti-scald protection and temperature control. This valve will allow a maximum water flow rate of 5.0 gpm (gallons per minute). It also has an adjustable high temperature limit stop to control the maximum water temperature. This protects you from extremely hot water temperatures. This KES product is a 2-way diverter shower valve that allows you to divert water between two outlets. It can be installed directly on your shower arm and you can switch water flow between a handheld shower head and a fixed shower head. This valve does not let you divert to both outlets at the same time. The design of the lever handle allows it to be operated easily with wet hands. KES PV4-2 made this valve of solid brass with a brushed nickel finish. It is a single unit which means there are no seams or attachments that can break off. The valve single inlet and two outlets attach to standard ½-inch connections. If you want to install a handheld shower head onto your existing shower, then consider using the KES PV4-2 diverter valve as a part of your solution. Do you want to install a shower outside? EZ-Flo makes the self-closing pull-chain shower valve with outdoor showers in mind. When you pull on the chain, it releases the flow of water out of the shower head. When you let go of the chain, then the valve automatically closes and water flow stops. 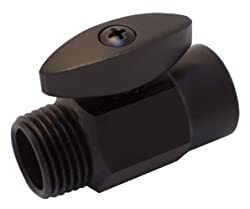 This valve fits all standard ½-inch pipe connections. EZ-Flo makes this product out of solid brass for durability and long performance. The chrome finish gives this valve a sleek appearance allowing it to blend in with any fixtures. This is a great solution for conserving water in an outdoor shower system. 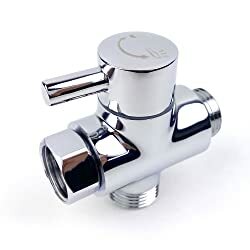 This Iyax solid brass shower valve is perfect for high pressure water systems as it will allow you to reduce the flow of water coming from your shower head. You can attach the valve directly to the end of your shower arm. It fits between the shower arm and the shower head to give you better water flow control. The valve allows you to shut-off the water flow at the shower arm completely. It has a new leak prevention design so you do not need to use teflon tape between the connections. The oil-rubbed bronze finish adds a classy look to this valve and will blend in well with other bronze finish fixtures. This volume flow control valve has a higher flow rate than a regular switch valve. It will give you a full range of volume control over the water flow coming out of your shower head. If you want to install a handheld shower head, then consider using the KES shower arm 2-way diverter valve to divert water flow. This valve allows you to divert water from your fixed shower head to a handheld shower head with a simple move of a lever. The design of the lever handle allows it to be operated easily with wet hands. This valve can be installed directly on the end of your shower arm before the fixed shower head. This valve will not let you divert to both outlets at the same time. The solid brass construction makes this a durable solution and the oil-rubbed bronze finish adds an elegant charm to your bathroom fixtures. This valve is easy to install and KES offers a 30-day money-back guarantee if you are not satisfied with the product. 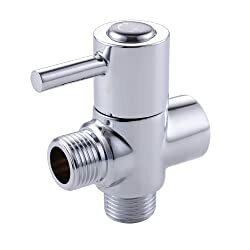 The KES PV14 chrome 2-way diverter valve is an easy solution to use if you want to install a handheld shower head. This product has a simple lever handle that can be adjusted to divert water flow between a fixed shower head to a handheld shower head. Although you can have water flowing from both shower heads, the valve wasn’t designed for this purpose. You will experience lower water pressure from both shower heads as a result. This valve is not designed to increase water flow for low pressure water systems. You can install it in a low pressure system, but it will still operate with the same water flow and volume. This valve is solid brass and has a sleek chrome finish. It is easy to install and KES offers a 30-day money-back guarantee if you are not satisfied with the product. This 7Trees product is designed specifically for diverting water from a fixed shower head to a handheld shower head. The image on the turn lever shows the proper lever position with a picture for each type of shower head. The lever is a quarter-turn lever and is easy to move even with wet hands. If you position the lever in the middle between the two shower head images, you will get a trickle of water out of each shower head. This valve is not designed to be a shut-off valve. It has a brushed nickel finish which blends in well with any bathroom decor. Shower valves regulate and control the water flow that comes out of your shower head. There are several things to consider before you decide on a shower valve for your shower fixture issue. We have shared some guidelines below for you to review. – This type of shower valve diverts water from one output source to another. 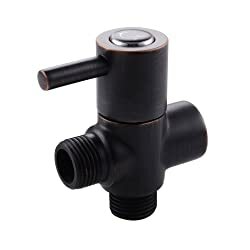 You would use this type of valve when you want to add a handheld shower head to an already existing fixed shower head installation. This is the best option for the money since it does not require additional piping. – A pressure-balancing valve will compensate for changes in water pressure. This is ideal for homes that may have older water systems in which the pressure is not consistent. – This valve blends hot water with cold water to make sure that the water is flowing at a constant temperature. These types of valves add a layer of safety to a shower system as they often include anti-scalding features. The most durable shower valves are made of solid brass or solid metal and have ceramic cartridges which help prevent hard water buildup. A ceramic cartridge is a solution for hard water if you often see lime and mineral buildup on your shower fixtures. This will give you the best defense against mineral buildup. Shower valves come in many designs, shapes and colors. If you select a valve that doesn’t require fixture trim, then you want to be sure you are selecting a valve that matches the color and finish of the shower fixtures already installed in your bathroom. This allows the valve to blend in smoothly with the rest of your bathroom decor. You should now have all the knowledge you need to select the best shower valve for your bathroom. When you decide on an option, be sure the valve will fit the size of your pipes. You also want to be sure the color and finish will match your existing shower fixtures. With a new shower valve, you can give your shower an upgrade with little effort!